Awe-inspiring Victorian interiors, elegant French cuisine and understated service are what earned this unique city restaurant its Michelin star, under the direction of acclaimed chef brothers Chris and Jeff Galvin. It's difficult to decide what's more impressive about La Chapelle – the dramatic, sumptuous setting or the outstanding food. 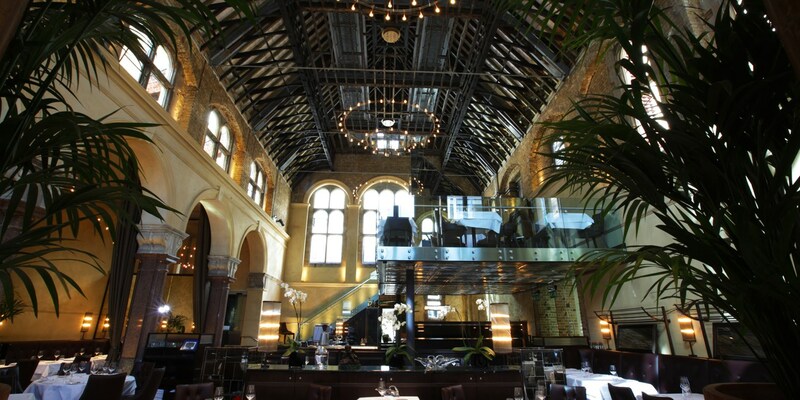 This Michelin-starred destination restaurant is housed in grade II listed St. Boltolph's Hall, a 19th century former school chapel just off of London's Bishopsgate Road. And like any good chapel, it has the imposing, utterly awe-inspiring, features to prove it – vaulted ceilings, vast pillars and grand buttresses, complemented by dark wood, leather furniture and equally elegant food. The menu is the work of acclaimed chef brothers Chris and Jeff Galvin, whose modern French bistro dishes complement the unique character of the premises. You'll find dishes like Pavé of Sea Trout with Clams and Chestnut Velouté, and Roast Chateaubriand with Pommes Anna and Glazed Carrots. Although their approach is classically French, Chris and Jeff haven't forgotten their British locale. 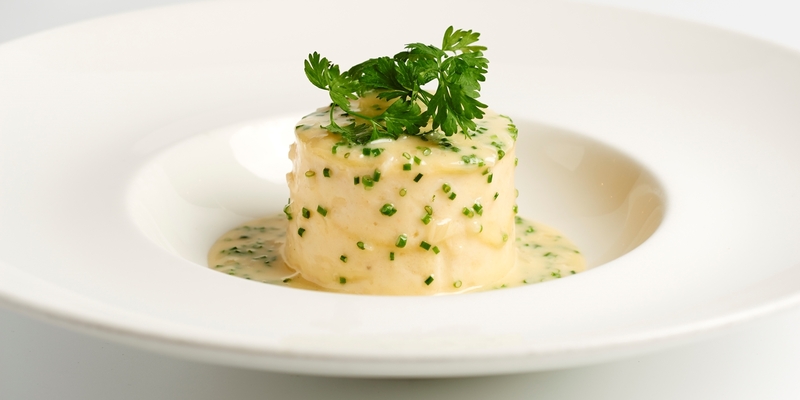 Dishes like Cured Lock Duart Salmon with Aquitaine Caviar, and Fillets of Cornish Red Mullet with Saffron Potatoes and Truffle Butter show off the brothers' knack for combining classic French cookery with exceptional British ingredients. Over the years, La Chapelle has seen various Galvin family members involved in the success of the restaurant, with brothers Jeff and Chris in charge of the kitchen, a third brother David sourcing ingredients, Chris’ wife Sara overseeing front-of-house and their son Emile involved in various capacities. A lovely family spirit – so key to the success of restaurants across the channel – can be found in abundance here. The service reflects a sense of tradition and decorum that befits the building and the cuisine, but at the same time, staff are friendly and inviting. It's this level of customer care, as well as the great food and terrific wine list, that's contributed to La Chapelle’s numerous accolades; from winning eight top restaurant awards in its first year, including London Restaurant of the Year at the AA Hospitality Awards in 2010, to Giles Coren, restaurant critic for The Times, choosing this venue for his wedding reception. The restaurant offers many dining choices, from à la carte to various prix fixe menus, including their family-friendly Sunday lunch which comes complete with dedicated options for children. 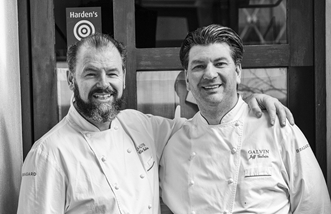 Or pop next door and try the Galvin brothers’ more relaxed sister offering, Café a Vin, which boasts a wood-fired oven, a very reasonable two-course menu and a varied wine list driven by natural and biodynamic wines. The restaurant claims to have the world’s largest collection of Hermitage La Chapelle, with bottles dating from 1952. They use the state-of-the-art Enomatic system for dispensing wine, which utilises inert gases to stop wine oxidizing in open bottles. This means that you can drink later vintages of this famous wine, grown on the east bank of the Rhône south of Lyon, for around £50 a glass, Or if you feel like pushing the boat out, a bottle of the famous 1961 vintage is yours for £19,500! Unlike many City restaurants, La Chapelle is a great bet on the weekend, when other venues quieten right down or close entirely. Still buzzing with excitement and glamour, there is a mixed crowd of artists and media characters that offers a different vibe to the usual business patrons, making this an excellent Saturday or Sunday night choice. The Sunday lunch – complete with children’s menu – is excellent value.